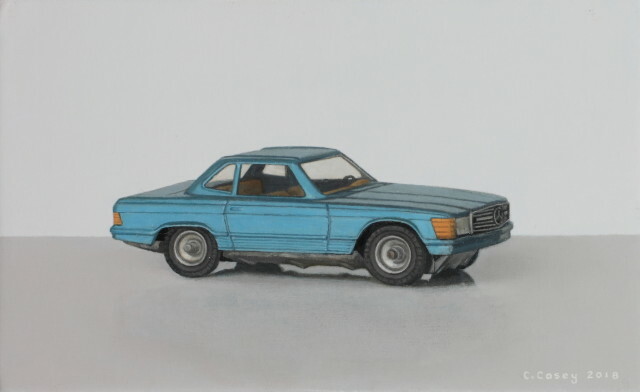 Casey’s small-scale still-lives in oil are intimate studies of everyday objects such as vegetables, fruit and children’s toys, each is meticulously observed. Casey also produces regular self-portraits and has twice been a finalist in the Hennessey Portrait Award in the National Gallery. He has also been shortlisted three times for the internationally esteemed BP Portrait Award in the UK and has appeared as a contestant on Sky's Portrait Artist of the year programme. Casey has received numerous important awards at the RHA and RUA (including the prestigious Hennessey Craig Scholarship) and his paintings have been selected by the Royal Academy in London from 2011 to 2016. His work features in many notable collections including the National Self Portrait Collection and the Ulster Museum. In 2015 An Post issued an edition of stamps featuring Casey’s toy paintings.